Dependent on the kind of marketing support you need, various online marketing help avenues exist – my opinion is always trying it out yourself using sites way better than mine to learn tips and tricks. Then contact a valued partner (achieve r.o.i), then hire an agency using initial returns rather then increasing spend (especially if your time is best spent running the business). Be careful with fees and contracts. 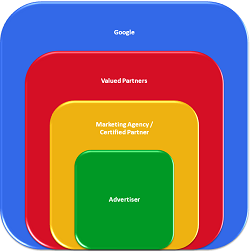 Google – Top of the chain and the best multi-level support ‘free’ can buy! What Are The Pro’s & Con’s Of Each Other Avenue? Advertiser – Self managing a campaign is easy. Best for small businesses, start-ups and marketing teams/students due to 0 management fees. Contact Google direct if anything goes wrong. Get help with marketing easily via learning portals online. The major downfall using this method is lost investment, online conversions and sales during intial learning period. Doing something extremely wrong could lead to permanent suspension and this is a headache no one wants. Marketing Agency/Certified Partners – If you can afford one, this is your best option. Use the Google Certified Partner Directory if you don’t have much time or pick an agency carefully. I usually prefer personality and expertise in an industry over any exams/certifications/stats. If you like the person and believe they can give honest marketing help then hire them. I usually prefer personality and expertise in an industry over any exams/certifications/stats. For example an agency Bold Internet an agency I don’t even know (so contact at your own risk) might not have the most extravagant or flamboyant – or even have much to show off about like more popular agencies (i.e. Search Laboratory, Epiphany Search, MEC) but I would still put my money on that smaller less flamboyant agency to have lower fees, higher quality and better results. Always shop around as much as you can for a decent agency and don’t just go for the big brands. The only real downfalls could be contracts, minimum spend requirements, false promises and not as much attention paid to the account as an advertiser might have preferred but all of these can be prevented if you ask for proposed strategies (as opposed to just costs) during your shop around. Downfall includes marketing help crossing over on some occasions. In return for the profitable support a direct advertiser may hire a agency and also get a call from the valued partner. On these occasions I would pick the marketing agency for the benefit of reports, analysis and maybe having already paid – I have the opinion paying for a services adds more incentive to the receiver which in theory should lead to better benefits for you. It’s always best to try managed online marketing campaigns yourself – but if it’s not that easy and you can afford to pay a marketing agency, then take your time finding the right one. If anyone ever contacts the non-endorsed marketing agency above (Bold Internet) let me know if my assumptions about them are correct. However one side might lead to lost investment and the latter could result in marketing fees. Valued partners are perfect for free neutral support and Google direct will support everyone at any level totally free on most occasions.